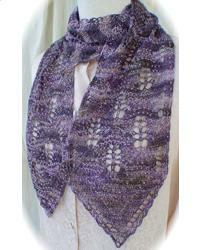 This lightweight, sparkly fashion scarf is a double treat for lovers of lace and beaded knitting. The design features laceweight yarn in closely-toned hues that is doubled to achieve added richness and depth, not to mention the bonus of quicker knitting. Project Size: 56" x 5"